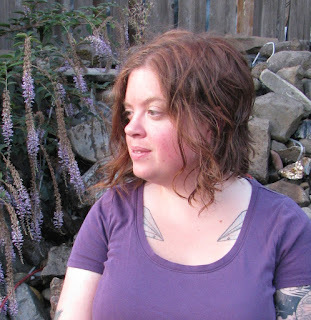 Erica is a writer whose short fiction I've admired for a while now, and I'm excited to share my blog today as she prepares to launch her debut novel. Characters navigating their mental health always catches my interest, but rarely does it let them save the local economy from interdimensional horrors. Over to Erica! Emmeline Kalberg, the protagonist of my debut novel Stay Crazy, has paranoid schizophrenia. But she's so much more than that. 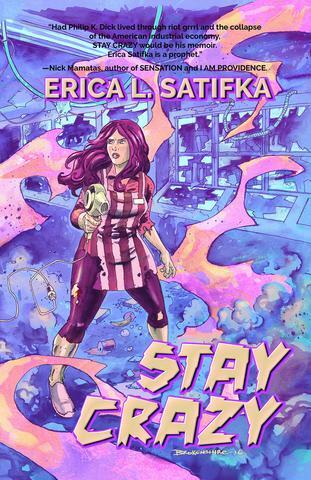 While Stay Crazy is speculative fiction, it takes place in the present-day real world, and Em not only has to deal with the monsters in the store and in her mind, but also the stigma that comes with her very misunderstood condition. That’s something I wanted to confront even in my title: the term "crazy" used in this context is not derogatory. My protagonist – like me! – comes from a working-class background, raised in a family that isn't exactly literate when it comes to mental health issues. "Crazy" is the word that other people would use to describe her, but it's also something Em herself is reclaiming. Too often, folks with psychotic disorders don't get to be the heroes of their own stories. Nearly always, they're given the role of madman or mystic, and I'm not sure which is worse. Okay, that's not true: the trope of the axe-wielding maniac is definitely worse. However, both of these portrayals are damaging, in that they reduce the character only to their illness. Even the accurate characterizations often fall into this. And because most people don't know (or rather don't know that they know, since it's something most people keep under wraps) someone with schizophrenia, the stereotype goes unchecked in a way that a one-note characterization of someone with anxiety would not. It was really important to me that Em be portrayed as someone affected but not defined by her illness, and Stay Crazy is not just an issues-book. While her schizophrenia causes her to speak to Escodex, an interdimensional investigator who recruits her to take down a universe-destroying entity, it’s still just a part of who she is, like her interest in offbeat comic books. I wanted to show that someone with this most stigmatized of mental illnesses can still be a complex human being, not just a collection of DSM symptoms. Stay Crazy is a book about a character who is more than her schizophrenia. It's a novel that shows what those in the mental health community know: that people with psychotic disorders can be just as well-rounded and heroic - – and yes, as bitterly sarcastic – as anybody else. And it also features a hair dryer raygun, so it's got that going for it too! Congratulations Erica. And rather a lot of applause. This is a topic dear to my heart. The common term he/she is schizophrenic DOES define (and dismiss) people. And is one I try hard to avoid.